The Stickyeyes Consumer Finance Intelligence Report takes a detailed look at the state of search in consumer banking and finance. Here are five key takeaways. With the growth and continued strength of the price comparison engines, the fall-out of the 2008 global recession still appearing to have an influence on search volumes and falling consumer confidence amid looming economic uncertainty, there are still a number of key challenges for brands in the consumer banking sector as they look to grow their visibility and revenue from organic search. 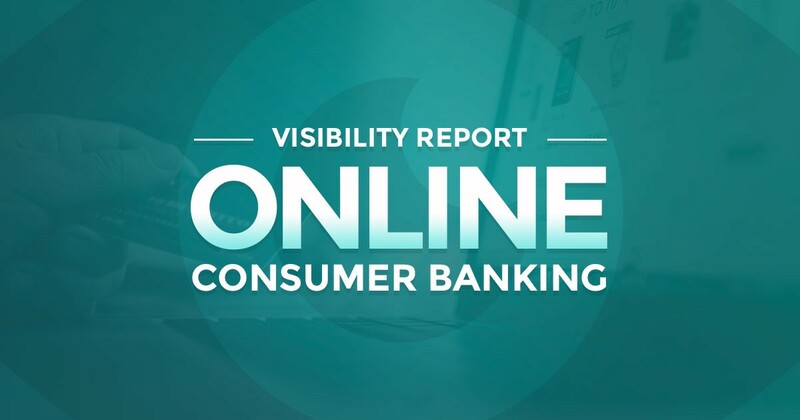 The Stickyeyes Consumer Banking Visibility report looks at the state of the search market in the consumer banking sector in 2018. 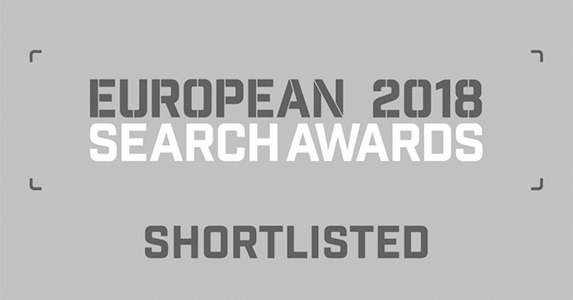 It assesses where brands were performing well in organic search, and where the opportunities were throughout the sector and in six key product areas. Here are the top five findings of that report. It is no surprise to see that the price comparison engines have been dominating the search engine results in the financial services market. But whilst two in particular appear to be strengthening their grip on the market, there are signs that the banking brands are themselves fighting back against the aggregators. MoneySavingExpert and Money Supermarket are the most dominant brands in the search engine results pages for the consumer banking market. The former generates an estimated 427,000 visits from organic non-brand search, which is more than three times the traffic generated by the most visible banking brand, Halifax. But whilst it is good news for the ‘big two’ comparison websites, we have seen some of the other price comparison websites lose ground as the banking brands develop their search strategies. We have seen some price comparison websites, such as Money.co.uk and ComparetheMarket lose some ground to brands such as Halifax, Barclays, Nationwide, Tesco Bank and Lloyds Bank. 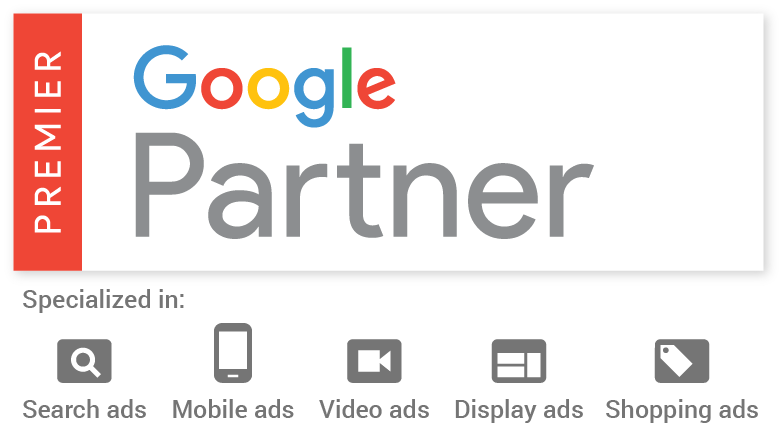 These brands appear to have changed their search marketing strategy to reflect the way in which the search market has changed, and the way in which consumers now discover products in this sector. These brands have focused less on the major traffic-driving terms that are largely ‘locked down’ by the comparison engines (although some still do have solid rankings in this area). 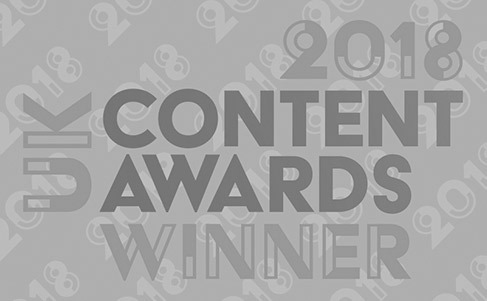 Instead, they have focused content and search marketing activity on providing content around informational search queries, around consumer advice, and on medium and long-tail keyword terms that reflect the full range of the user journey. 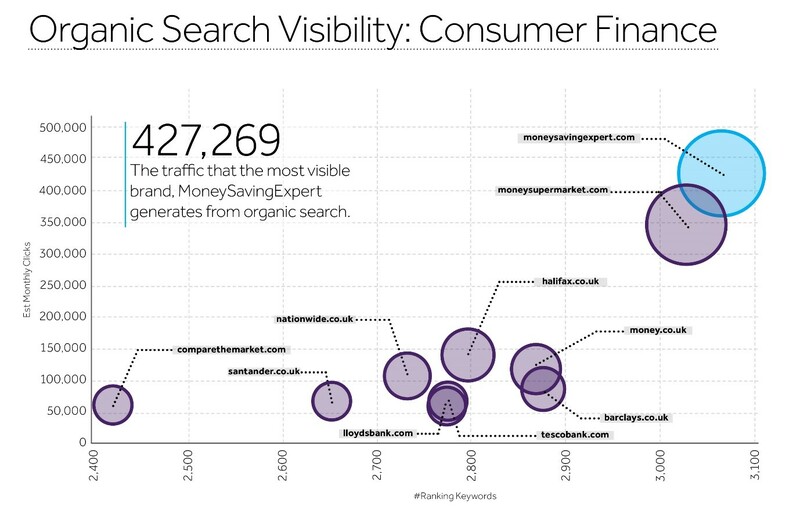 The mortgages product area is the biggest driver of traffic and search volume in the consumer finance market. The 219 keywords in the dataset that we analysed generate a search volume of 959,640. That represents just over 32% of the overall search volume in this market. The biggest group of keywords by some distance in the consumer finance market is around mortgage calculators. The keyword “mortgage calculator” and derivatives of the term account for 42% of the total mortgages keyword volume, and 16.8% of the keyword volume in the entire consumer financial services sector. These two terms are also two of only four (the others being ‘loans’ and ‘car finance’) to drive in excess of 100,000 searches. 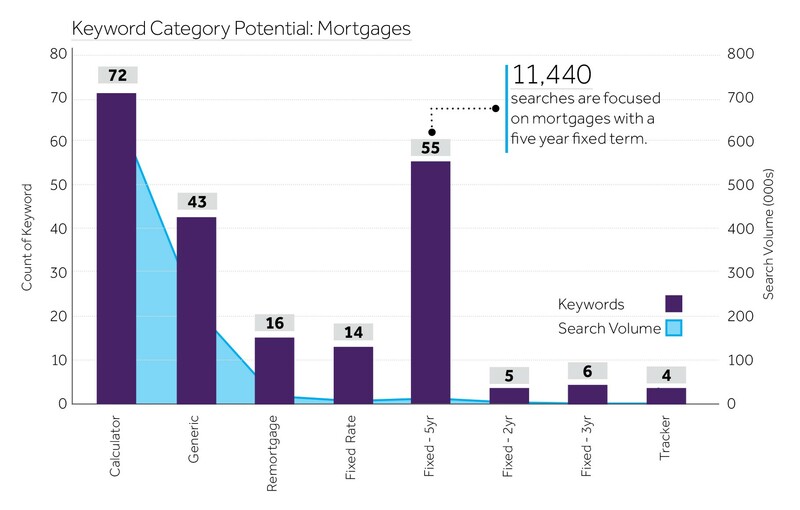 By comparison, The most searched-for ‘generic’ keyword in the mortgages market is the term “mortgages”. This has less than a quarter of the search volume of “mortgage calculator”. in consumer banking is from the keyword "mortgage calculator"
for the keyword "mortgage calculator"
One of the reasons why MoneySavingExpert and Money Supermarket are able to achieve such strong visibility is the way in which they are able to achieve rankings across almost all of our keyword set. MoneySavingExpert ranks for 96.7% of our keyword sample, whilst Money Supermarket ranks for 95.6%. 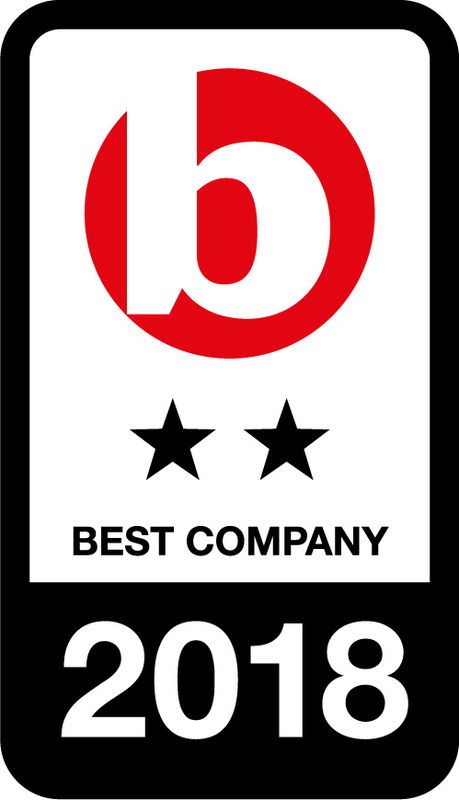 The only other brand to rank for more than 90% is Money.co.uk. Whilst keyword coverage is itself just one of many factors behind search ranking and visibility, content plays an important role in the customer journey. It is important for any brand to ensure that they are serving content that is relevant to any traffic-driving keyword query in their respective market. Even when we compare the two leading brands to two of their competitors (Money.co.uk and ComparetheMarket), we see the scale of this ‘content gap’. 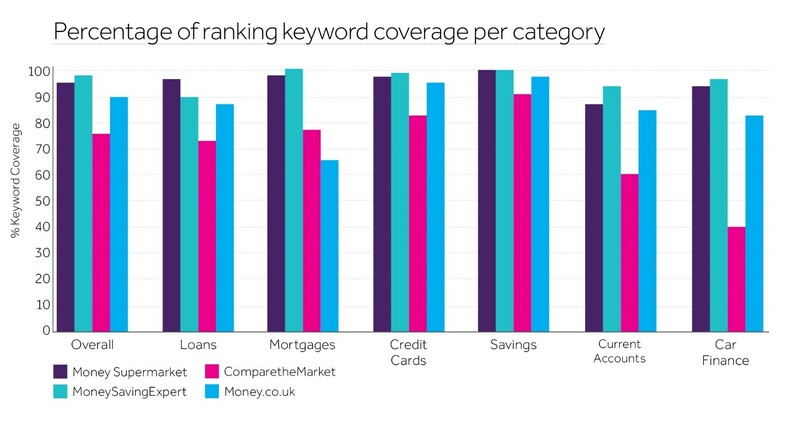 In markets such as mortgages, current accounts and car finance in particular, we see that these two competitors fall some way behind the keyword coverage of the leading two brands, and other brands in the consumer banking sector experience the same problem. Whilst some brands will naturally experience this ‘content gap’ due to not competing in certain product areas, those brands that do effectively offer a ‘full service’ product range need to ensure that they are plugging the gaps in their content marketing strategy and capitalising on each and every keyword term. Whilst keyword coverage is itself just one of many factors behind search ranking and visibility, content plays an important role in the customer journey. The market for car financing products has increased significantly since the economic recession. Between 2010 and 2016, sales of new vehicles in the UK has grown significantly. More than 2.3 million new cars were registered in 2016, compared to 2.03 million in 2010 (Source: SMMT). Much of this growth has been due to new forms of vehicle financing, most notably Personal Contract Purchase (PCP), and the rising popularity of long-term leasing and rental products. Car finance products now make up £58 billion (29%) of the £198 billion of total consumer borrowing according to the Bank of England financial stability report (June 2017), £24 billion of which has been lent by banks, with the remainder provided by automobile manufacturers and dealerships. 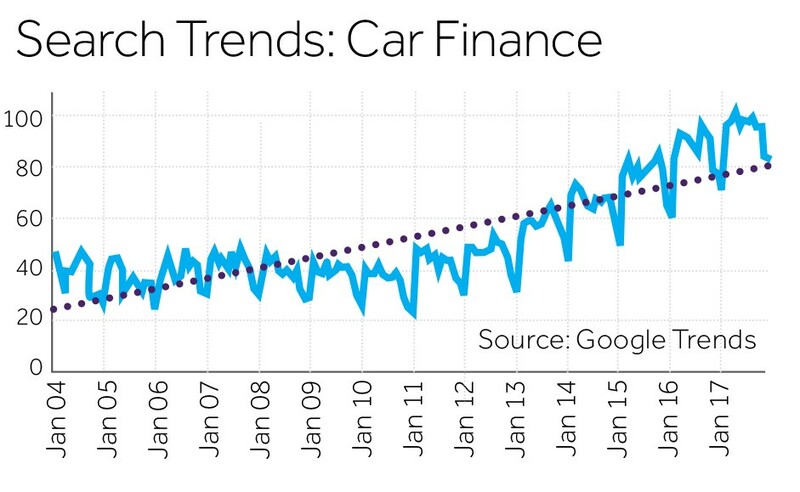 The popularity of these car financing products is reflected in search activity, with monthly search interest in car finance products increasing 56.5% since 2004. Today, car finance represents the fastest-growing search market in the UK financial services sector. The popularity of these products has seen many banking brands adapt their strategy to deliver a specific proposition around car finance. For example, Halifax Bank and Lloyds Bank (both part of Lloyds Banking Group), both have a specific car finance proposition that will allow the consumer to arrange their own finance, with the respective banks paying the dealership directly. Other brands, notably Sainsbury’s Bank, TSB and Santander, have focused heavily on specific landing pages to capture car finance search queries, whilst still promoting what would be considered a traditional loan product. Whilst established brands do tend to feature the most prominently in our report, there are certainly signs that so-called ‘challenger’ and ‘fintech’ brands can come into the market and shake up the search results. In car finance, we see a search environment where there are numerous opportunities for brands to make real headway in that search market. With prime lenders competing with sub-prime lenders, traditional banks competing with car dealership groups and comparison websites not really dominating the market in the way that they do in other sectors, there are opportunities for brands to really drive quality traffic in this fragmented search result. And the presence of fintech brands like Zopa in the personal loans market is a sign that relatively new brands can ‘muscle out’ established operators with the right proposition and a strong search marketing strategy.